At some now-forgotten Toronto Film Festival, I stopped to say hello to Roger Ebert, who I knew from the film festival world, mostly Telluride. Ebert was sitting in the back of a theater in the Varsity, a multiplex that at the time hosted most of the what the festival called "press and industry" screenings. Roger had a spot in the upper right hand side of the theater that he seemed to favor, almost a perch. We talked for a few minutes. Roger (I don’t know why, but it seems odd to call him "Ebert") got up. I figured he was off to the bathroom. Cinema Interruptus sans Roger Ebert: 2007 Interruptus the first without Ebert. Can it work? Instead, he turned me around, and said, "I want to introduce you to someone." He guided me toward a row even further back than his, and introduced me to Brian De Palma, who was in Toronto watching movies. De Palma didn’t have a film in the festival. He was there as a fan and lover of movies. So Roger tells De Palma that he should meet me because I’m a critic he should know about, and I sheepishly look at the floor. I’m embarrassed because I’m in no way convinced that Brian De Palma needs to know anything about me. Still, it was a nice gesture from someone who certainly didn’t need to introduce me to anyone. I’d met Roger even before I became a film critic. For a feature in the now defunct Rocky Mountain News, I interviewed Ebert about his TV show, which was just beginning to catch on. It was still on public TV. Like most newspaper people, Roger was a good gossip. He always seemed to know things about people, and I was happy when, in one Telluride encounter, I was able to tell him something he didn’t know about an editor who had worked in Chicago. I don’t want to give you the impression that Roger Ebert was a friend. He wasn’t. Like every other critic who worked for a newspaper and who covered film festivals, I knew him a little. That’s all. On one level, he was another guy on the circuit, although — of course — he wasn’t. He was famous. Everyone knew who he was. Everyone wanted to talk to him. At one Sundance Film Festival, I was talking with a colleague about Ebert’s inexplicably prodigious output. "I asked him about it,” said my friend. "He said the key to covering a film festival is to make sure you get enough sleep." I wondered how the hell Roger managed that since he wrote a lot and seemed to be everywhere. As I thought about Ebert’s death, I remembered seeing him sitting on the ground in a park in Telluride, taking notes as he talked to Richard Widmark, who was receiving a Telluride tribute that year. Widmark already was part of an older generation of actors, but Ebert wanted to spend time with him. He knew he’d get a good story out of it. 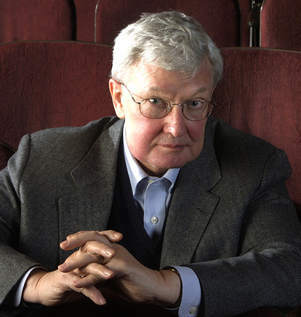 As many have pointed out, you could learn a lot about newspaper work by watching Roger Ebert, and I think it’s more than nostalgia that makes me say that he remained a newspaper guy until the end, 46 years of reviewing movies for the Chicago Sun Times. That’s one hell of an accomplishment in a time when a newspaper career that lasts 46 months might be enough to make you an old-timer. I don’t know that anything more needs to be said, although it seemed only right to say something. Roger was lucky enough to be part of the raucous days of Chicago journalism, to work for the Sun Times when it was a vital newspaper — brash, muscular and home to some great writers. Sure, he became an Internet presence and a TV celebrity. As for me, though, I’m more envious of the fact that he knew Mike Royko than that he appeared on the Johnny Carson Show. And if you don’t know who Mike Royko was, well ... you may not know who Roger Ebert was either.